Use our custom tools to find your ideal Telluride property. 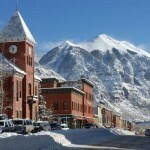 EASILY SEARCH TELLURIDE REAL ESTATE BASED ON YOUR CRITERIA. The Telluride region consists of several different areas in and around Telluride. If you are not familiar with the areas, it may be helpful to look at the area descriptions before you move forward with your search. Advanced Property Search: Allows you to focus in with greater detail. Map Search: Choose your location based on visual map search. Property Tracker: Create and access saved searches and favorite listings. Receive email updates when new listings are added, and email or request more info on all your favorite listings at once. There are many nuances to finding your ideal Telluride property. The best way to search Telluride Real Estate is to work with a local Telluride Real Estate Broker, such as Ray Bowers, to help you navigate through the many choices and options. Telluride is not just a world class ski resort, but a year-round lifestyle. As you search Telluride Real Estate you will find a community bulging with recreational activities, such as horseback riding, mountain biking, fly-fishing, hiking, golf, tennis, hot air ballooning, and so much more. There are also plenty of opportunities to enjoy casual and fine dining, and lots of shopping in our locally owned businesses. Telluride also boasts a thriving arts community, and an incredible summer festival schedule. There are plenty of opportunities to enjoy high quality music, fine arts, theater, and dance. Your ideal Telluride Property Search should include a combination of lifestyle choices and your ideal property. Combining these two criteria will give you a rich and rewarding Telluride experience.